Present state: Both platforms, cattle dock and the main station building are extant. The station building is in private occupation. Notes: In the 1790s the only building at Six Mile Bottom was a paddock run by a stable keeper. The hamlet derives its name from its distance from the start of Newmarket Racecourse and because it lies in a valley bottom. When the Newmarket & Chesterford Railway opened an intermediate station was built at Six Mile Bottom but it was named Westley. 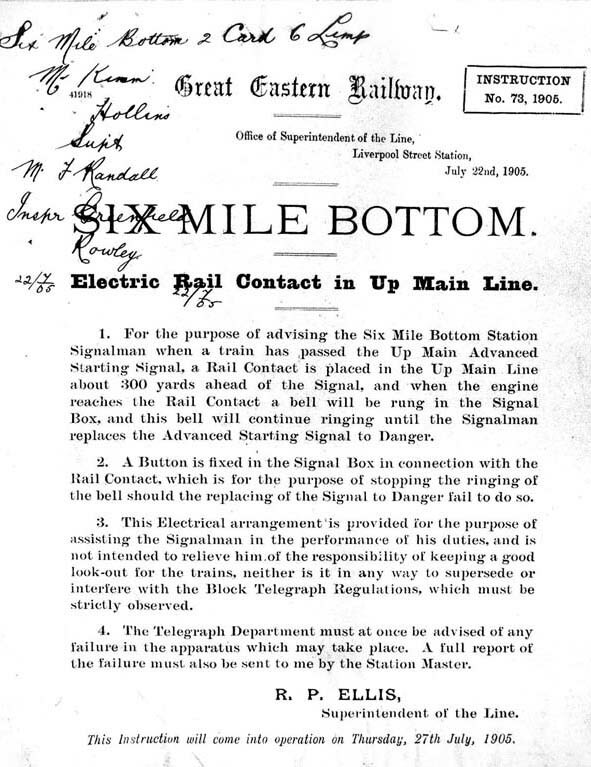 This name was short-lived and the station was renamed Six Mile Bottom in October 1848. 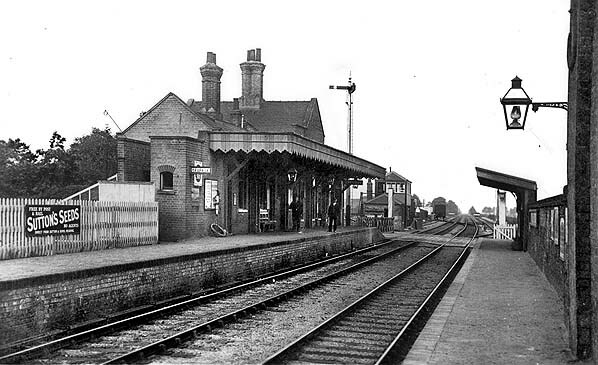 The station closed with the Newmarket & Chesterford line on 1 July 1850, reopening on 9 September 1850. The station was provided with two facing platforms on the east side of London Road. The building comprised a two-storey stationmaster's house with a pitched slate roof and a gable facing onto the platform. There was a single-storey wing, also beneath a pitched slate roof at right angles to the house; this contained the booking office and waiting room. The building was extended eastwards several times along the platform by the Great Eastern Railway with further alterations being made by British Railways. A wide canopy was provided along the full range of buildings with a small canopy above the entrance to the booking office. In December 1859 a ten-yard section of the down platform was boarded at the rear to support a timber awning for weather protection. In April 1856 the Locomotive and Permanent Way Committee discussed a requirement for accommodation (engine shed) at Six Mile Bottom, but there is no further record of it in company records. There was a collision at Six Mile Bottom on 9 October 1859 at approximately 11.40pm when a special goods ex Newmarket hit a special train of empty horse boxes. also ex Newmarket. Acting guard Titmarsh was killed and porter Dickenson seriously injured. Cambridge Locomotive Superintendent Mr Thomas Kitson attended the inquiry. Driver Ward was suspended pending the inquest which delivered a verdict of accidental death; he was later acquitted of manslaughter. The main part of the goods yard was to the east if the London Road level crossing on the down side; it comprised a large goods shed built in 1857 and later extended behind the down platform served by a long loop siding. The siding ran over London Road and through the shed but was not protected by the crossing gates. In September 1859 the down siding was extended as a refuge for goods trains. There was another siding on the up side running up to the east end of the up platform. On the west side of the crossing on the up side two parallel sidings served a cattle dock end-on. The dock was alongside the up main line and railings were provided along the edge of the dock to prevent livestock falling onto the track. Cattle pens were sited alongside the sidings. Immediately west of the crossing on the up side there was a brick crossing keepers cabin. 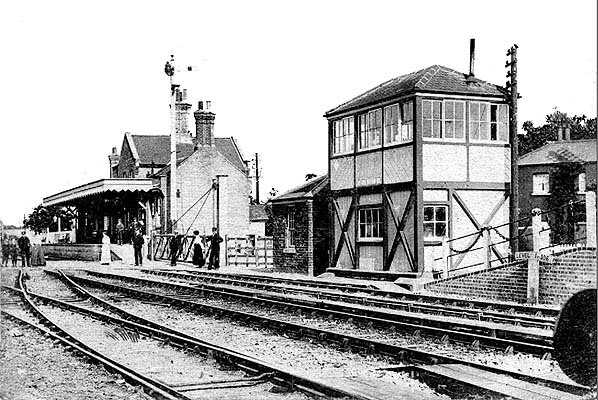 In June 1875 a tender of £1,301 from Saxby & Farmer for a signal box was approved. This was more than double the cost (£579) of the Fulbourne box but the cost was later reduced to £722. It was built between the crossing keeper's cabin and the cattle dock and might have replaced an earlier box. Four station cottages were built to the south of the crossing on the east side of London Road. In March 1882 new grain shed was approved at a cost of £350. The goods yard closed on 13 July 1964 and, after lying derelict for some time, the goods shed was refurbished as a depot for the collection of waste paper. The site was subsequently cleared and redeveloped for housing in 1995 (Ardross Court). As a result of these developments, on 4 October the same newspaper was able to report that the some stations on the line had been given a reprieve and that Dullingham, Kennett, Thurston and Elmswell would remain open but the others would close. There was little opposition to the closure of Six Mile Bottom as the area is somewhat thinly populated and 'in the middle of nowhere'; little has changed today apart from the housing development on the site of the good yard. 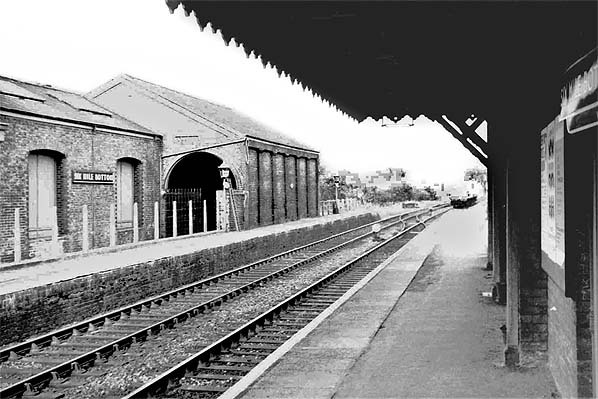 The station closed on 2 January 1967. The level crossing gates were replaced with lifting barriers c1975. 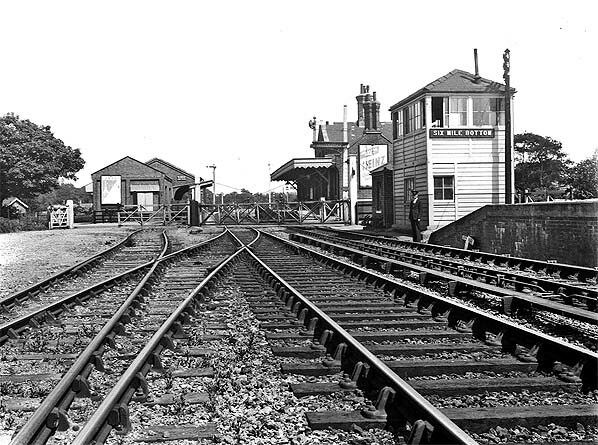 The line was singled in 1983 and the signal box closed and the level crossing was automated under the Cambridge re-signalling scheme on 8 May of that year; the box was quickly demolished. 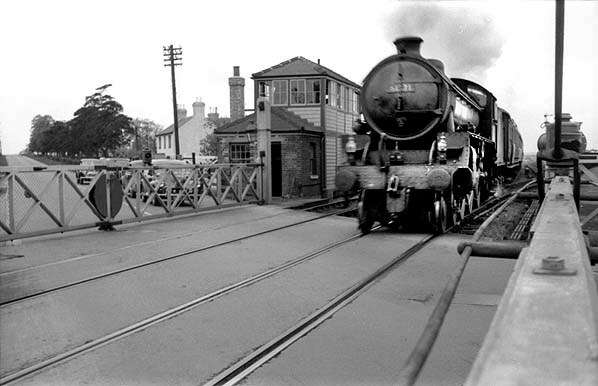 Click here to see an animated film of a rail journey between Fulbourne and Cambridge in 1950. Route map drawn by Alan Young. Tickets from Michael Stewart (except 2846 Brian Halford). Totem from Richard Furness. Working timetable from Great Eastern Railway Society. Six Mile Bottom station looking south-west from the down platform c1905. 1895 1" OS map shows the junction with the original line to Great Chesterford one mile south-west of Six Mile Bottom station. Having closed on 9 October 1851 the track was probably quickly lifted. The trackbed is still easily traceable from its junction with the Cambridge line. 1902 1:2,500 OS map shows the layout of the station and goods yard. The main part of the goods yard is to the east of the London Road level crossing on the down side; it comprises a large goods shed behind the down platform served by a long loop siding. The siding runs over London Road and through the shed but is not protected by the crossing gates. There is another siding on the up side running up to the east end of the up platform. On the west side of the crossing on the up side two parallel sidings serve a cattle dock end on; cattle pens are sited alongside the sidings. Two buildings are seen on the up platform; that to the west, closer the crossing, is believed to be the original N&C building while that to the east is a later Great Eastern Railway construction. The two buildings are joined by a canopy. A small shelter can just be made out on the opposite platform. The signal box and adjacent crossing keeper's cabin are sited between the dock and the crossing. Four station cottages are seen to the south of the station. Click here to see a larger version of this map. Click here to see a larger version of this map. 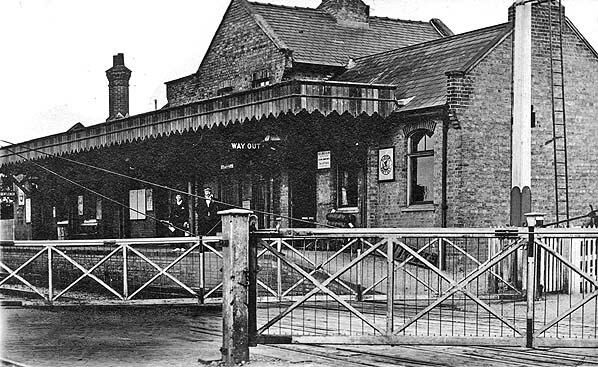 The main station building on the up platform c1905. The map above shows that these are two separate buildings very close together and joined by a single canopy; that is not obvious in this picture. The two-storey part of the building and the wing to the right are believed to be the original N&C building. The single-storey wing to the left was built by the Great Eastern Railway. The 'Way Out' sign leads through the booking office. Six Mile Bottom station looking south-west from the down platform c1908. The down platform was provided with a very basic shelter in 1859 - little more than a short section of canopy supported on a timber wall to the rear. The gents' toilet is seen at the east end of the main building. 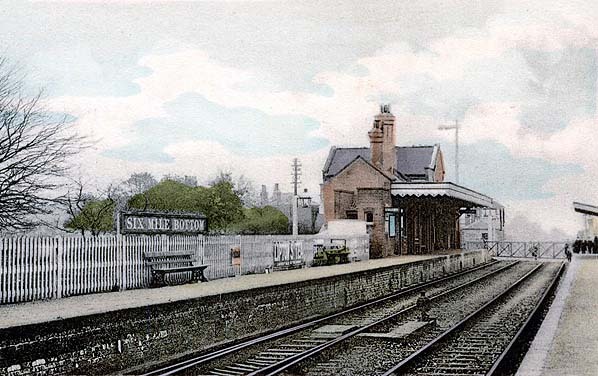 The London Road level crossing and Six Mile Bottom station looking north-east c1910. The large goods shed is seen to the rear of the down platform; the lower extension to the shed is probably a later addition. A wagon is seen in the siding beyond the up platform. Six Mile Bottom signal box c1010. The box was built by Saxby & Farmer in 1875 but may have replaced an earlier box. The brick crossing keeper's cabin is seen between the box and the cabin. The cattle dock is seen on the right; this was used only for end-loading with railings along the north side to stop livestock falling onto the main line. 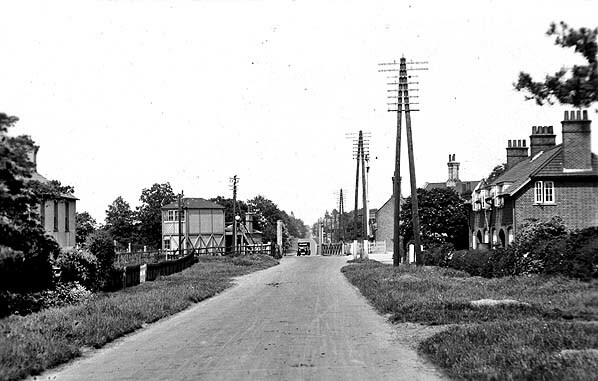 Looking north along London Road c1920. The signal box is to the left of the crossing with the station out of view to the right. 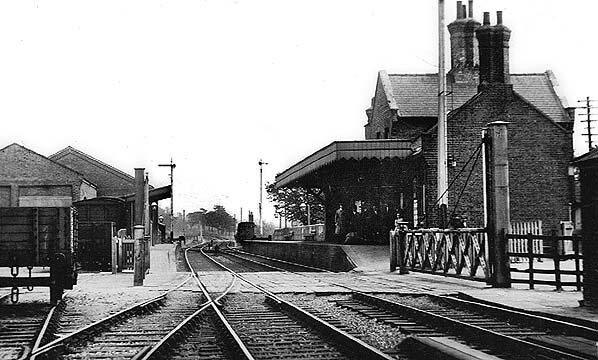 Looking north-east towards Six Mile Bottom station before June 1930. The siding that runs through the goods shed is not protected by the crossing gates. The white gate to the left gives access to the west side of the yard and is not for closing the road. The weigh office is seen behind the gate. Approximately one mile west of Six Mile Bottom station was the junction with the long defunct Chesterford (now Great Chesterford) section of the Newmarket & Chesterford Railway. 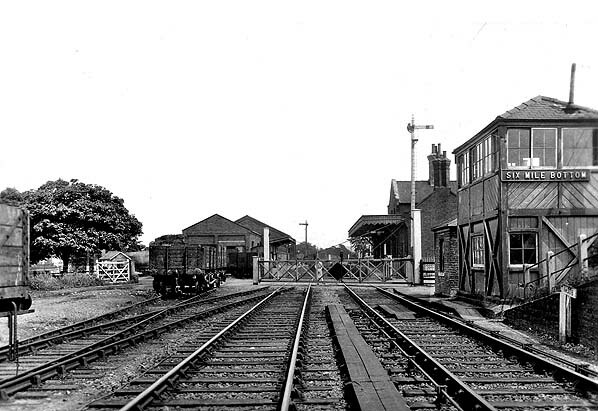 This is the site in January 1950, almost a century after final closure. The actual point of divergence was at the extreme left and the line ran where the gap in the bushes can be seen to the left of the second telegraph pole from the camera. 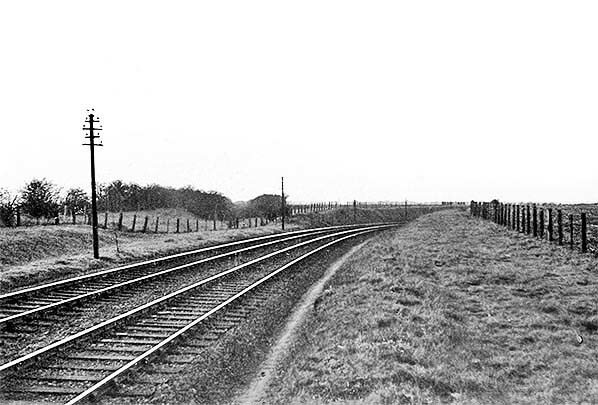 The Chesterford line followed a gentle curve as far as Fleam Dyke, shortly after which Balsham Road station was located. The line to Fulbourne and Cambridge veers away to the right and its track was singled during the 1980s. Looking at the far end of the fence on the right, one can just discern in the distance the bridge taking Mill Road over the railway and there was a corresponding bridge, now infilled, over the Chesterford line. The term 'Six Mile Bottom Junction' is academic as from surviving Eastern Counties Railway (ECR) records it is impossible to be certain if there ever was a physical junction at this location and relevant records of the Newmarket Railway have not survived. However, one track of the double track Chesterford route was lifted and the materials used to complete the Cambridge 'extension', as it was referred to, and ECR records do drop hints that a physical junction did exist during construction of the extension. Nevertheless, what we do know for certain is that as the Cambridge line opened on the same day as the Chesterford line closed for good, Thursday 9 October 1851, Six Mile Bottom Junction was never used by public passenger trains. Determining quite when the remaining single track of the Chesterford line was lifted requires some effort. Surviving records reveal a dispute between the ECR and the Newmarket Railway regarding who was to undertake the work. We know from a surviving record dated 2 June 1853 that the track was still in situ on that date and the following year the ECR bought-out the Newmarket Railway Company. It is therefore likely the track was finally lifted by the ECR and there is some vague evidence that the final section, at the Chesterford end, was not removed until as late as 1858 as this was the year Chesterford Junction ceased to exist. In 2016, 66 years after this photograph was taken, the site of Six Mile Bottom Junction remained visible from passing trains. An eastbound passenger service hauled by a Thompson-designed B1 approaches Six Mile Bottom station in 1959. The loco is carrying the express passenger headcode so the train is possibly a Liverpool Street - Bury St Edmunds through service. This loco is one of 410 built between 1942 and 1952. The class build was split between 274 built by the LNER and 136 built by BR, the largest batch being 150 locos built for the LNER by North British Loco Co between 1947 and 1948. Six Mile Bottom station looking north-east along the up platform in May 1966. Note the totem sign on the right. All of the stations on the Newmarket Railway were fitted with BR Eastern Region blue totem signs in the 1950s. Those at Cambridge and Newmarket were, however, short-lived and were quickly replaced with illuminated signs on concrete posts. Note the large goods shed with its later extension and side doors for loading.